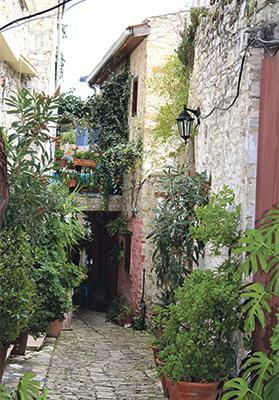 Cyprus villages offer peace and tranquillity. Having been raised outside our beautiful islands, there was truly nothing more wonderful than the first sight of Malta as we would descend into its torched landscape for two or three months of sun, sea and freedom every summer; my trip to Cyprus did not only bring all those feelings rushing back, but it heightened my expectations about what I would discover on an island not very dissimilar to our own. 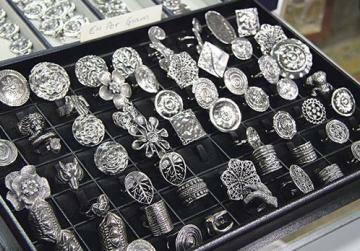 At the silversmith in Lefkara. A country of contrasts, Cypriots are as warm and bubbly by nature as the hills and mountains which they are surrounded by are calm. Despite the fact that the island can be described as being sleepy in nature, there are pockets of activity everywhere you look: whether you’re going on a romantic weekend to get away from it all or for the throbbing party scene which dominates the Southern Coast, you’ll be catered for either way. Of course, the best way to start any journey and have a proper introduction to a country is by delving into its history and in this aspect, Cyprus does far from disappoint. Proud of their Greco-Roman roots, sites such as Kourion have been restored to their former glory and are more than worth a passing visit. 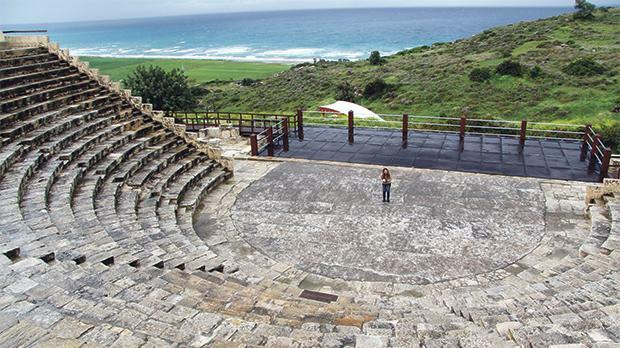 At Kourion, one can stand in the vast splendour of a theatre which is still used for musical and theatrical performances and visit the ‘House of Eustolios’, which is but a short stroll away. Originally a private villa, it was turned into a public recreation centre which consisted of baths and rooms covered in mosaics. Much of it has been preserved and bears witness to the fact that there are few peoples as fun-loving as the Cypriots. Architecture buffs will definitely enjoy the mishmash of modern landscapes dotted with ornate churches and cultural gems such as the Kolossi Castle which is not only a fine example of military architecture, but also bears witness to the various twists and turns in Cyrpus’ interesting history. With their strong ties to family, tradition and religion, many Cypriots have not drifted far from the way of thinking of their forefathers and this is clearly illustrated by how full their churches are on Sundays and the passion with which they speak about their families. Family recipes are felt to be something sacred, almost grudgingly passed down from generation to generation and it is not uncommon for extended families to live together. Their love for life cannot only be seen in the food they painstakingly prepare, but also in their forms of entertainment. During yet another dinner organised by the Cyprus Tourism Organisation, who took care of catering for every detail of our visit, the table heaved with so many local sausages, halloumi and creamy desserts that by the time the beautiful raven-haired singer asked us to get up and join her in dance, all we could was heavily sway in time to the music. That said, if it is a party scene you’re after, thanks to Cyprus’ diminutive size you have the facility to move from the internationally renowned resort Ayia Napa to any other point of the island freely and quickly. Literally translated to mean ‘Holy Wooded Valley’, it seems somewhat ironic that this particular spot of Cyprus has become one of the world’s foremost clubbing spots where sleeping is optional. Here, the parties truly are never-ending, starting in the late afternoon and going on all night. That said, should you want a slightly more relaxed day which is still full of fun and adventure, you can always visit the Water World Ancient Greek-themed water park. With more than 25 different rides, it is little wonder that this park has attracted more than four million people since it opened its doors over 20 years ago. If there’s something that the Cypriots know more about than anything else, it’s hospitality. Whether you’re keen on embracing the local culture by visiting mountainside agro-tourism spots where you can learn how olive oil and wine are made or you want to club till dawn with a stunning backdrop, Cyprus truly will remain a place close to your heart. Emirates is offering a companion fare promotion on flights to Larnaca, Cyprus where two or more passengers travelling together in Economy Class can benefit from a special fare starting from €198 per person to Larnaca, inclusive of taxes. A weekend surcharge of €20 applies for departures on Fridays or Saturdays. The offer is valid for tickets booked and purchased by May 21 for departures from May 1 up to December 31. 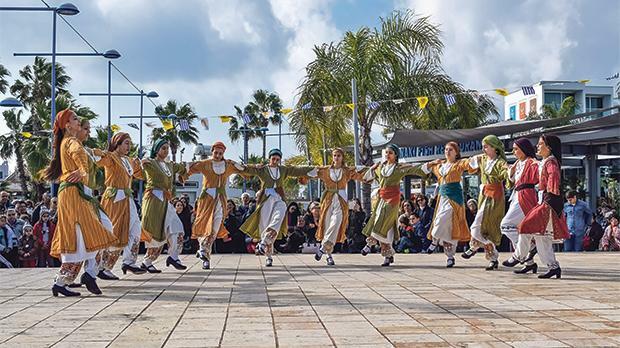 Cypriot dancers during a show.